Based in Hersham in Surrey, Applied Laser Engineering Ltd (ALE) design & manufacture a range of laser engraving machines. 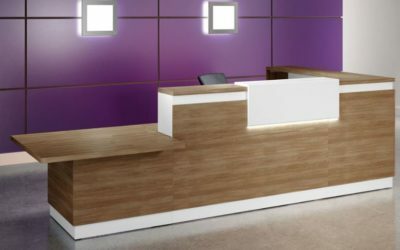 The company wished to create a modern meeting space for engagement with visiting clients that reflected the efficient progressive nature of the business. ALE approached Solutions 4 Office to help with the manufacture and supply of a glass table to seat 8. 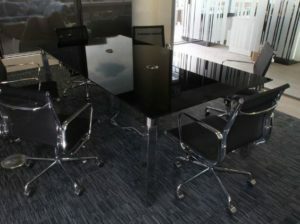 Commenting, Hedi of Applied Laser Engineering explained “Solutions 4 had a good selection of glass meeting tables on their website but we needed help so spoke to them directly to explain our requirements. They quickly understood what we needed for our meeting area and even offered to plan the whole area for us to show the best size, shape and design of table that would work in the small space we had. The room was for multi-use and even incorporated a bar drinks area. The Solutions 4 designers drew up plans including our other items and showed how our IT and presentation equipment could be integrated”. The Solutions 4 Office Interiors team designed a black glass meeting table with integrated power, data and comms facility within the top. The ability to pull-up the module to allow users to connect makes for a very modern and usable meeting facility. The tables looks great and is very functional. 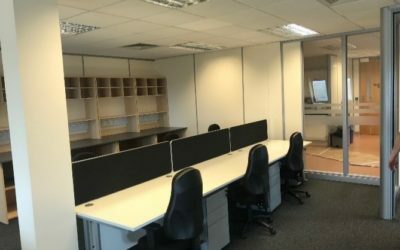 Solutions 4 Office were proud to be able to help ALE refurbish their boardroom area and to provide such an attractive piece of modern boardroom furniture and look forward to supporting the client with future requirements. Call us to discuss any requirements 020 3551 6957 or email us.